Disclaimer: SmallRig sent me this cage for review purposes. I'm not being paid or obliged to write good things about it. All opinions about is are my own. 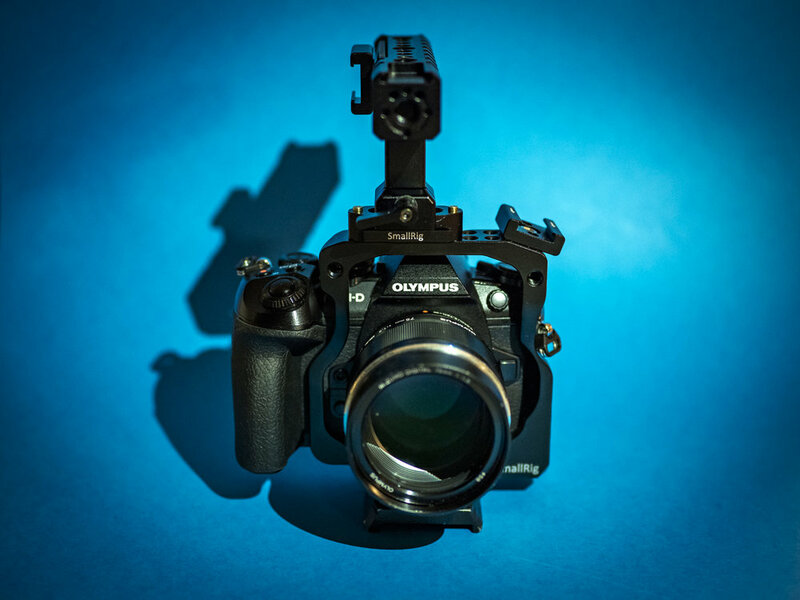 I was very happy when SmallRig announced that they were working on a cage for the E-M1 Mark II. Since I've been looking to get a cage for my Olympus cameras for a long long time, but there hasn't been any good options. Most of the options has been bulky generic ones, that fits pretty much any DSLR or Mirrorless camera. No custom made ones for a specific Olympus model, until now. I have used this cage for about two weeks now and on a few different assignments. Both handheld and on a tripod. My configuration might not be perfect yet, and I will probably adjust it a bit. But I have been able to mount an audio recorder, wireless lav mic receiver and a monitior/external recorder to the cage/rig simultaneously. I choose to not include cables in the pictures, since that would obstruct the view of the cage. I will try to add links to all the parts I used for my rig. When I opened the package from SmallRig, all the parts was neatly packed individually in zip-lock bags and all of the bags included a proper allen key. The cage is machined from one solid piece of aluminium alloy and is very sturdy. It has no play what so ever! All the edges are nice and rounded and won't damage you or your camera. And there's more than enough mounting points for my needs. The cage fits snug on to the camera and does not obstruct any buttons or the battery door. One exception tho, I have pretty small hands and I'm having troubles to reach the depth of field preview button with my fingers when the cage is mounted. I wish they would have made a groove in the cage here, like they have done next to the lens release button. Like I said in my review of the Olympus 12-100 f/4, I hate carrying stuff around. But this cage is really light weight (116g, cage only) and the added weight does not bother me at all. I added the 46mm NATO safety rail on top of the cage, so I easily can add or remove the NATO top handle without the need of any tools. This is perfect if you, like me, can't fit the camera with the top handle attached in your camera bag. The top handle can easily be adjusted backwards or forward by loosening two 1/4" screws with the included allen key. This allen key works for pretty much any screw on the rig and is "hidden" on the side of the handle and is held in place by magnets. This is a really smart design and it does not obstruct the handling what so ever. The handle can aslo be slightly adjusted sideways on the 46mm NATO safety rail (46mm is SmallRigs shortest one). This makes it easy to balance the rig when you add accessories. I have never been a fan of friction arms or tiny ball heads. So for my Atomos Ninja Blade monitor/recorder I got the "DSLR Monitor Holder Mount" and a NATO quick release clamp so I can quickly change from the top handle to the monitor. The monitor mount is all metal, low profile and super sturdy. The friction of the monitor can be adjusted by tightening or loosening the allen screws. Often when I shoot, I record external audio from one or multiple sources. And previously I have been mounting my Zoom H6 to a Gorilla Pod and clamped that, plus a wireless lav mic receiver to my tripod (or just had it laying beside me or on the ground). But now I can finally mount the Zoom H6 and the wireless receiver to my camera, using two cold shoe mounts, and have it right in front of me when I shoot! This is super helpful for me and makes it less of a hassle to record proper audio. The lav receiver is unfortunately not pictured but I use a cold shoe on the side of the top handle to mount it. When I got the cage and the other parts from SmallRig, I also received a HDMI-clamp that was supposed to fit the rig. This clamp was not able to secure my Atomos coiled HDMI cable at all. The clamp barely reached the cable and could not grip it. This might just be my fault but something that I want to mention. The protective casing on my cable connector is all metal with rounded edges, so It might help to add some gaffers tape on the connector, to add some size and a more grip friendly surface. But if you look at the picture below, you can see what I'm talking about. But if it was just a few millimeters longer, it would have been perfect. Despite the two "flaws" that I mentioned, I am very happy with the cage and it has been a joy to use my camera the last two weeks. I will definitely keep the cage on my E-M1 Mark II and continue to use it. Since it is so small and lightweight that there is no need to remove it if I am just shooting stills. For me, this rig has the perfect size to mount everything I need. And without being bulky when all accessories are removed. I would recommend this cage for anyone who uses their E-M1 Mark II for film making and want to add a top handle and/or other accessories like microphones, monitor, audio recorder or LED-lights. -For me, the DoF review button is hard to reach with the cage mounted. I'd wish they had made a groove in the cage, like there in next to the lens release button. -The recommended HDMI-lock does not grip my slim Atomos cable.